How islands can be made more accessible and better connected through EU or national policies was the main issue that CPMR island regions debated in a seminar on 17 October 2016 in Palma (Balearic Islands, Spain). “An island economy lives or dies by its connectivity”, was a quote used during the UK debate on whether to build a new runway at Heathrow airport, but it also proved a very apt summary of the seminar´s key discussions. Heathrow is the busiest airport in Europe, while the CPMR island regions are suffering from low connectivity and poor accessibility in terms of the frequency, duration and cost of transport. If, as this quote suggests, the UK needs more connectivity, what about remote islands that suffer from real insularity? During the seminar, the CPMR and the regions involved stressed that they need their voice, and the issues they face, to be heard at EU level. 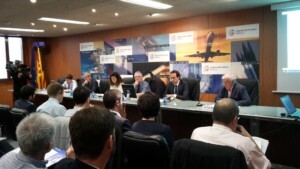 Co-organised by the CPMR Islands Commission and the Balearic Islands Government, the meeting offered an opportunity for the Islands Commission to restate its position and argue for the principles of accessibility and more island-friendly EU transport policies. During the meeting, the island regions also argued for a territorial dimension in the evaluation criteria for the Connecting Europe Facility (CEF). They stated that International Public Service Obligations or other mechanisms must ensure connectivity between islands from different Member States, as well as re-introducing aids for new maritime routes and aids for air routes with third countries.